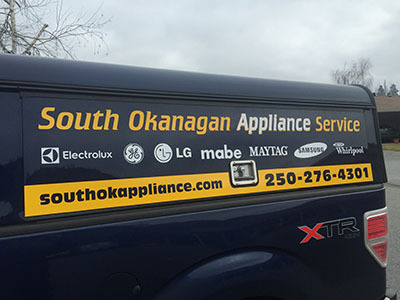 Located in Penticton, British Columbia, South Okanagan Appliance Services repairs and installs most makes and models of household appliances throughout the South Okanagan. We offer fast, friendly service for your appliance repair needs. South Okanagan Appliance Services is an authorized warranty depot for several brands of major household appliances. Call South Okanagan Appliance Services for Dishwasher Installations! Happy Easter! We will be closed till Tuesday. Hope everyone has a great weekend with family and friends. Clayton and his helper were a pleasure to deal with. He was very prompt in replying to me, informative and helpful. He also gave me very good pointers on caring for my machine and extending its life span. I would highly recommend using South Okanagan Appliance. Clayton squeezed me in today to fix my washing machine. Very professional. I’m impressed with the quick response. I will definitely use him again. Clayton was not only prompt but very knowledgeable. Also only did what was needed at a very fair price. I would definitely recommend him. © 2019 InfoTelMultimedia.ca - iNFOnews.ca - South Okanagan Appliance Services - All Rights Reserved. View our InfoTel.ca listing under Appliance Service and Repair for Penticton.